Arizona’s communities, industries, mines and Native American tribes aren’t likely to be affected during the next five years if federal officials declare a shortage on the Colorado River, officials said Wednesday. While Central Arizona Project rates may rise, deliveries for groundwater replenishment would be eliminated and central Arizona agriculture would take a hit, leaders of a workshop held at the Arizona Department of Water Resources said the state is ready for a shortage on the Colorado. “Despite the fact that we see a shortage on the horizon, we are not in a crisis,” said Tom Buschatzke, director of the Department of Water Resources. More than 100 people attended the Colorado River Shortage Preparedness Workshop hosted by ADWR and the CAP. After years of drought Lake Mead’s level is dropping toward the point that the U.S. Department of Interior would declare a shortage triggering a first phase of cuts to deliveries in Arizona. The CAP has said there’s a strong possibility of a shortage being declared by 2017 on the Colorado River, which supplies roughly 40 percent of the state’s water needs. If a shortage is declared, farmers who rely on CAP water will have to change to crops that use less water, farm fewer acres and begin pumping more groundwater, Buschatzke said. But he said the state has spent years preparing for this possibility, including programs allowing water providers to store surplus water underground. “We recognize that we have challenges and we want to make sure that people understand we are working hard with partners to make sure we don’t ever get into a crisis” Buschatzke said. Arizona has a plan in place to access stored water when needed, and the CAP and ADWR closely monitor the situation along the Colorado River, he said. In the meantime, he said, the state is a leader in recycling and reusing water, including putting treated wastewater to use. The timing of a shortage is unclear however the CAP and the ADWR are prepared to handle the effects of the current drought through underground storage, water conservation plans and water efficiency projects. “We just don’t want to get into the situation that California is in,” Buschatzke said. 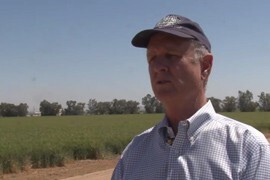 With central Arizona agriculture first in line to see water deliveries reduced if a shortage is declared, the CAP is offering financial incentives now to encourage farmers to reduce their usage, said Chuck Cullom, the CAP’s Colorado River programs manager. “We are basically paying them to reduce their use of CAP water,” Cullom said. The Central Arizona Project gave a state-one shortage declaration due to the water levels of Lake Mead. 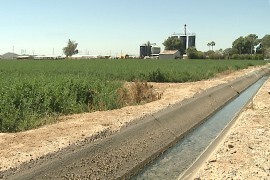 If a water shortage was to impact the state, it would mean Arizona agriculture wouldn't be as financially viable, and famers may have to get out of the business or move somewhere else. 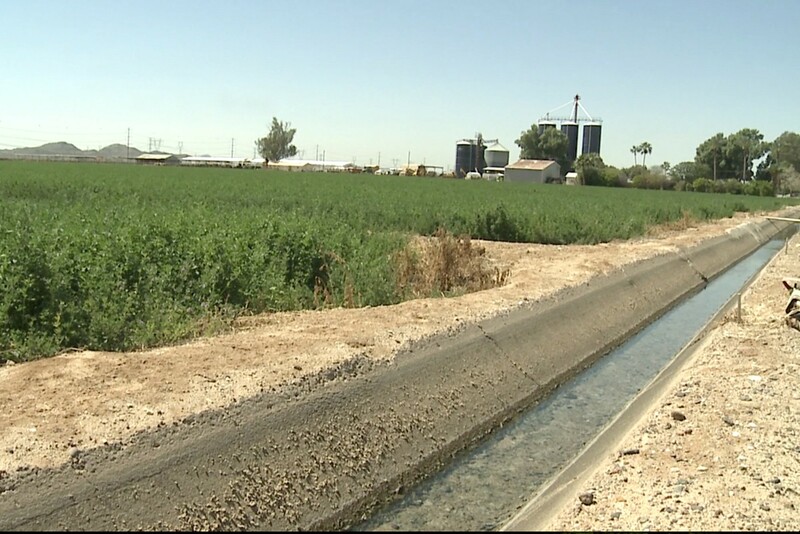 An irrigation ditch carries water at A Tumbling-T Ranches in Goodyear. 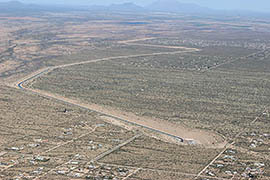 The Central Avra Valley Storage and Recovery Project recharges groundwater using Colorado River water delivered by the Central Arizona Project.